1. A day out with my friend Nana on Wednesday. At ten in the morning when we were supposed to meet up it was still raining cats and dogs. The rain really was poring down with buckets, and at first we didn't really know what to do with our day. Nana bought herself a cute umbrella and put on some good music in her car. It was an hour's drive to reach our destination in Holland and we sang along with the music the whole time. That cheerful mood of ours must have changed the minds and the moods of the weather gods, because by the time we were halfway there the rain had stopped! Later in the morning we even had sunshine! 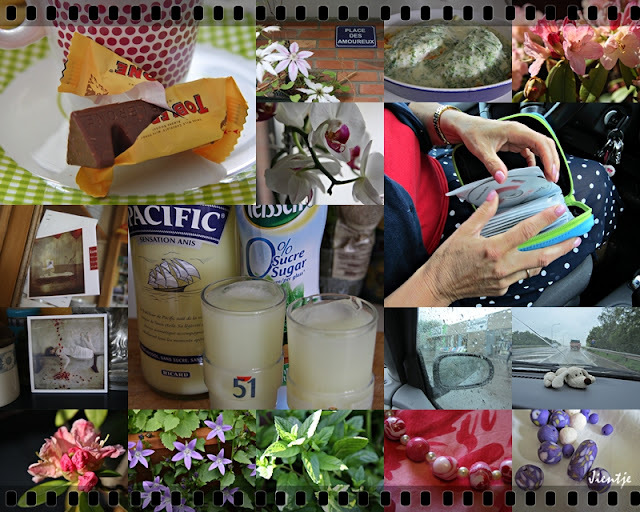 We went to Etten-Leur, a small shopping paradise in Holland. 2. Shopping for shoes at bargain prices. I've been looking out for red shoes for quite a while now, but had not really found them until now. Nana took me to her favorite shoe shop.The shoes over there are a lot cheaper than in Belgium, and not only did I find the red shoes I had been dreaming of, I also found two more pairs! A girl can never have too much shoes now can she? I paid only as much as one pair would have cost me in Belgium! 3. Alcohol free Pastis. Pastis with the taste but without the sugar and the alcohol of our regular aperitif. We stay away from alcohol during the week but me and my hubby are addicted to our aperitif ritual whenever he is home. This is a perfect alternative! 4. Toblerone mini chocolate bars. When I was on holiday in Switserland as a teen I tasted Toblerone chocolate for the first time in my life. Although I haven't bought it much over the last decade, I still think it's a heavenly treat. I found these individually wrapped minis in a local supermarket, and now I can enjoy the almond and nougat laced milk chocolate with a nice cup of Senseo coffee! 5. A hand written card from Kamil Vojnar. We bought one of his art photos about two years ago, and he let us know he will be in his galery in Saint Remy in France during Summer. Too sad we're not going to Saint Remy this year, but it was nice hearing from him. I'm sure we'll get to visit him and see his latest work when we go there next year. We've had a couple of nice "warm-weather-feels-like-Summer" days the past two weeks, so I spent more time outdoors rather than behind my computer, that's why I haven't posted in over two weeks! June already, I just knew the month of May would whiz by in a jiffy! It's Friday, that means it's time to look back upon the week that has passed and post some favorites. 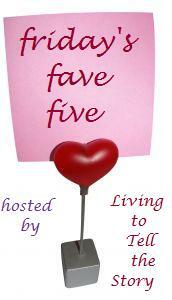 Time to join Susanne's Friday's Fave Five! 1. Last Friday was our 21st wedding anniversary, and my husband surprised me with a lovely bouquet of roses. He knew I would most probably welcome him on the patio, when he parked his car down below. He didn't want me to see the bouquet just yet, so he smuggled it in through the front door before he parked the car! That man is so smart, he still knows how to surprise me even after all those years! 2. I've got my camera back!!! My Big Guy has been fixed, and it cost me nothing! This time they had to replace the shutter, but there was a six month warranty on the previous repair job, so they did it for free! 3. The roasted pineapple we had on the barbecue. We injected it with rum and coconut liqueur and roasted it for an hour. Served with some ice cream it was delicious! 4. 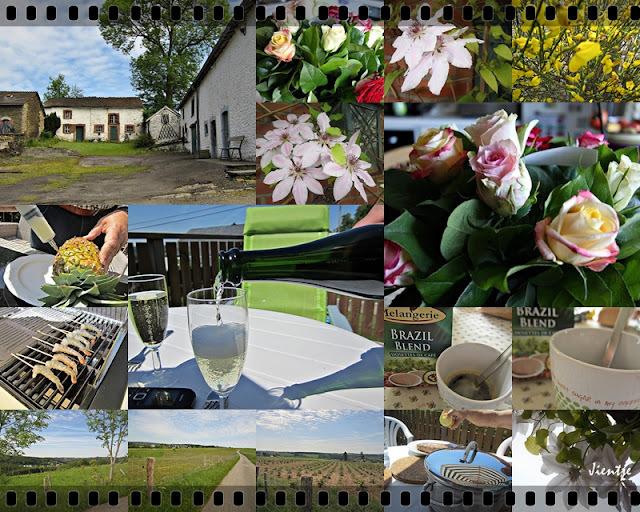 We were invited to spend a day in the Ardennes by our daughter Patsy last Sunday. It was a beautiful day, and we made a nice long walk before lunch. After that, lunch was prepared on the barbecue. It was wonderful to be outside all day and enjoy each others company in the warmth of the sun. 5. We love to experiment and try new flavors on the new barbecue, and with the warm weather we had last weekend it was time to enjoy our patio! This time we tried shrimps with a raspberry dressing, served as an appetizer. I would never have imagined shrimps with raspberries, but it's wonderful!